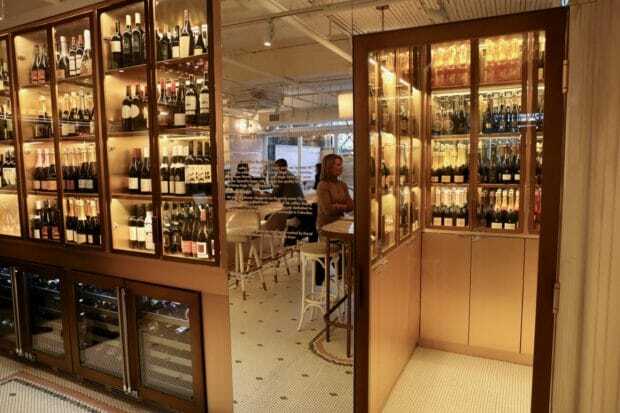 Coffee Oysters Champagne Toronto is the most recent addition to the trendy King West restaurant scene. The French restaurant is located directly across from Roy Thompson Hall in Toronto’s theatre district. Coffee Oysters Champagne (also known as COC Toronto) offers a hidden patio, intimate cafe and champagne bar, and a secret French speakeasy dining room. 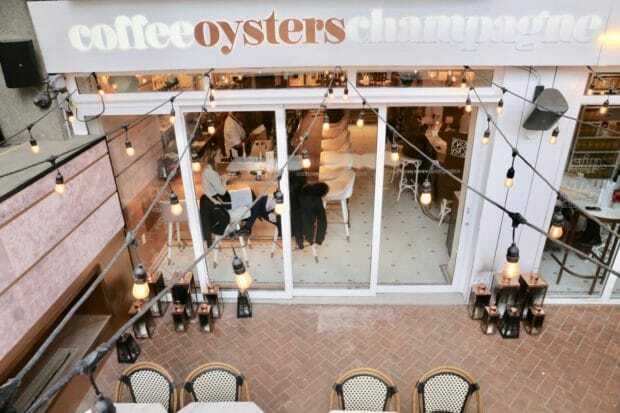 Coffee Oysters Champagne Toronto is brought to you by tech entrepreneur Sanjay Singhal and Oakville restaurateur Steven Daicos. The concept was inspired by Sanjay and Steven’s three favourite things: coffee, oysters, and champagne. Coffee Oysters Champagne Toronto’s patio on King Street West. If you’re standing on the sidewalk in front of 214 King Street West, peer over the banister and you’ll find COC Toronto’s pretty patio. During the warmer months, the patio at Coffee Oysters Champagne Toronto features seating for an intimate group of 8-10 diners. In the evening its a truly romantic King West restaurant patio, decorated in glowing lanterns and overhead fairy lights. Inside Coffee Oysters Champagne Toronto. Step inside COC Toronto and you’ll find a champagne and oyster bar meets cute cafe. In the morning hours, COC Toronto offers French pastries and sustainable single-farm speciality coffee from Colombia. It’s the perfect place to grab a cappuccino and croissant en route to work. We also love the popular King West restaurant’s sun-soaked interior, embellished with bright white and pretty pink. It’s a perfect bar on King Street West to meet a client for a power lunch. Coffee Oysters Champagne Toronto has a capacity of 50. The petite restaurant fills to the brim shortly before 5pm as its a great place to enjoy post work champagne sips and slippery oysters. The secret dining room entrance to Coffee Oysters Champagne in Toronto. Award-winning agency Navigate Designs, creatives behind Toronto’s Mira, assisted with the design and branding behind Coffee Oysters Champagne Toronto. The space evokes a richness detailed in rose onyx walls, marble and gold tables, and plush velvet banquette booths. COC Toronto was purposefully designed to create a unique consumer journey and tell a story of glitz and glamour balanced with illusion and opulence, gradually unveiled one Easter egg at a time. First time visitors to COC Toronto should be aware that there is far more to the restaurant than its elegant oyster and champagne bar. If you’ve booked yourself a dinner reservation, the smiling hostess will take you on a “champagne tour,” which meanders into a tiny champagne bottle hall of fame. With the flick of her wrist, the walls fall away, exposing a secret French speakeasy restaurant concept. The dining room, simply called à toi, is inspired by the 1930s French hotel lobby bar. The hostess stand appears like a hotel check in counter. For those checking their coats, you’re given a hotel room key before a bell boy skips through the space to show you to your table. Photographs are strictly forbidden here (sorry Instagram fans). 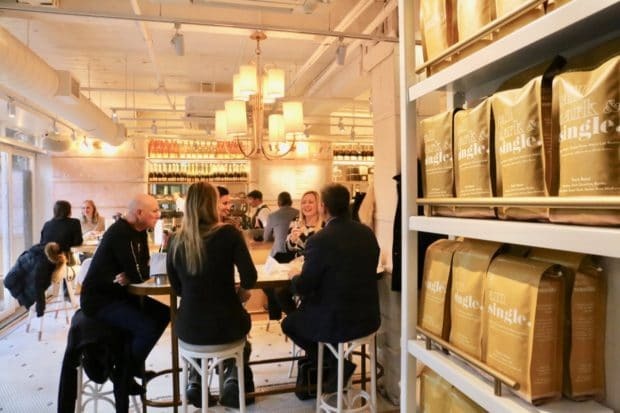 The Coffee Oysters Champagne Toronto owners want food fans to enjoy the magic of the experience for themselves. I can assure you that COC Toronto’s attention to detail in overall guest experience is top drawer! The oyster and champagne bar at COC Toronto. 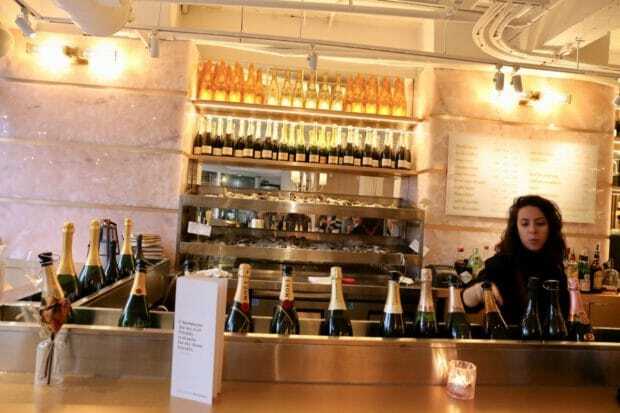 COC Toronto has the largest champagne and sparkling wine list in the city. The impressive bubbly list includes bottles of sparkling Ridgeview Brut ($112) to a 3,000 ml vintage Louis Roederer ‘Cristal’ Brut from 2007 ($4,888). 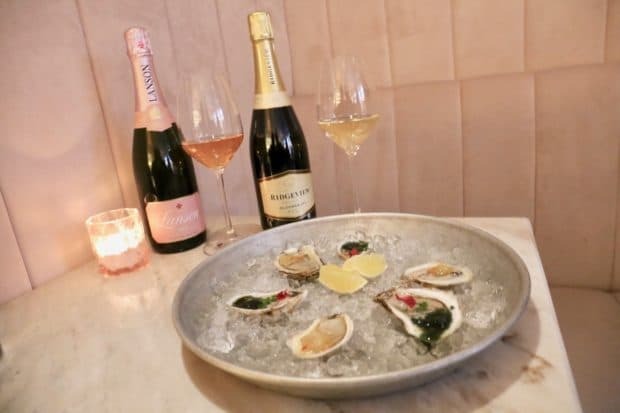 Or you can opt for a $9 glass of Fiol Prosecco, which pairs perfectly with the bars East and West Coast oyster offering. If you’re dining at à toi you’ll find a large cocktail menu with a strong focus on muddled cognac libations. COC Toronto’s à toi also offers craft beer, and fret not, champagne and quality wine bottles are never in short supply. 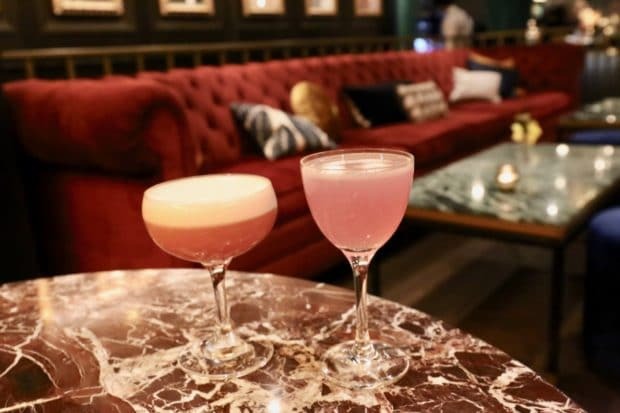 Craft cocktails at Coffee Oysters Champagne Toronto. Chris Wilkinson, Executive Chef at Coffee Oysters Champagne Toronto, fell in love with food at a young age. He was first inspired by his British families home cooked meals. With over 14 years of experience in professional kitchens, Chef Wilkinson offers an elevated French inspired menu rooted in the fresh and foraged. Oysters and champagne at COC Toronto. COC Toronto has the largest dressed oyster selection in the city! Liver & Onions at Coffee Oysters Champagne Toronto. Chef Wilkinson’s à toi menu begins with a list of “petite” French appetizers. Carrot Terrine: swiss chard, orange reduction, fried herbs, endive salad, hazelnuts. Steak & Bones: veal marrow, steak tartare, pickled mushrooms, puffed barley. Mushroom Salad: cured egg yolk, trevssio, sherry, puffed rice. 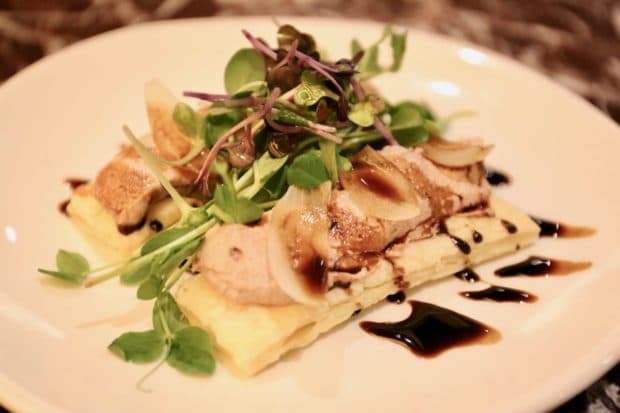 Liver & Onions: chicken liver mousse, lardons, pearl onions, puff pastry, pomegranate molasses. 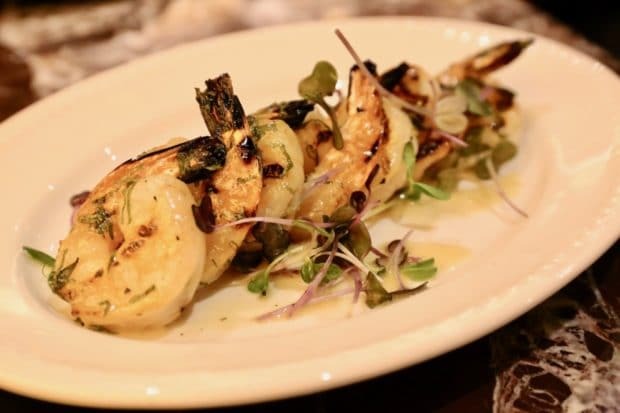 Grilled Shrimp: white shrimp, lemon butter sauce, fresh herbs. Almond and Eve: endive, black oyster mushrooms, green apple, almond gremolata. Sous Vide Octopus: grilled with salsa verde, celeriac remoulade, lemon, chervil, roasted beets. Popcorn Sweet Breads: amaranth, pickled mustard aioli. Crab & Caviar: lump crab, chili, lemon, house crackers, fennel cucumber consomme. Coffee Oysters Champagne Toronto’s à toi menu also includes a “moyen” offering featuring classic French entrees. Meat & Potatoes: AAA flat iron PEI, frites, beef jus. 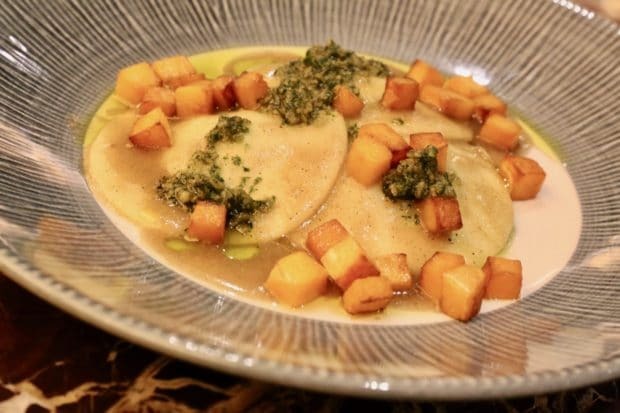 Swiss Chard Ravioli: onions, ricotta, smoked broth, squash puree, pumpkin seed pesto. Arctic Char: sautéed frisee, braised leeks, beluga lentils, fennel. 7oz Burger: ground chuck/brisket, caramelized onion, le douanier, frisee, fries. 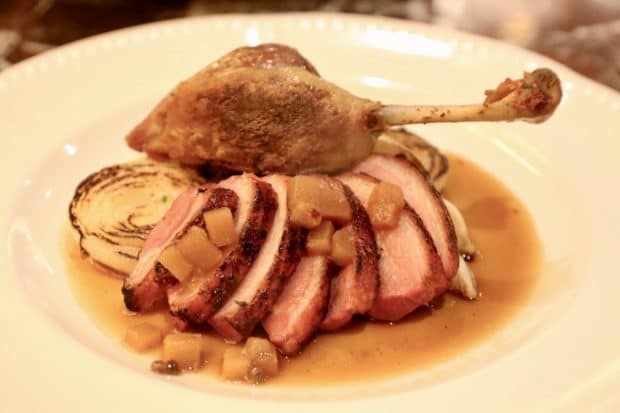 Two Duck: seared breast, confit leg, cipollini onions, tokyo turnips, mushrooms, spiced fruit. Swiss Chard Ravioli at Coffee Oysters Champagne Toronto. Decadent duck at Coffee Oysters Champagne Toronto. 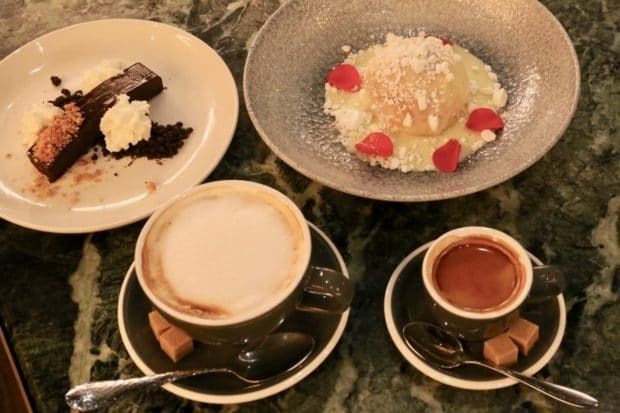 COC Toronto’s à toi menu finishes with a petite “apres” offering featuring classic French desserts and high quality coffee. Savarin: sweet baked, brandy, creme patisserie, vanilla. Honey Panna Cotta: sour cream, yorkshire parken, flowers. Chocolate Bar: chocolate soil, ginger mousse, orgeat almonds. Coffee and desserts at COC Toronto.